As of Monday, July 9 total oil product stocks in Fujairah stood at 18.922 million barrels. Total stocks fell by 6.1% from a 10 month high seen last week. Stocks of light distillates fell by 20.5% week on week to 6.106 million barrels. 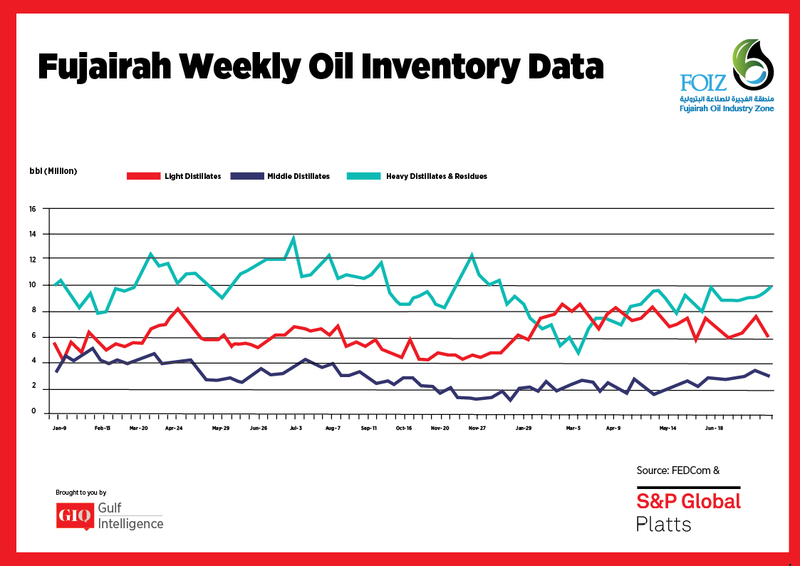 Demand is seen as steady in the Middle East, but with firmer prices in the Mediterranean there were few opportunities for Middle Eastern gasoline buyers to obtain barrels at competitive rates, market sources said. European gasoline supply to the Middle East has been cut by U.S. summer demand, as well as the emergence of additional demand from West Africa. Spot premiums for Arab Gulf RON 95 gasoline remained close to recent six-month highs at $3.80/b yesterday. Stocks of middle distillates fell by 12.5% week on week to 2.916 million barrels. After reaching a nine-month high last week, stock levels fell for the first time in six weeks. 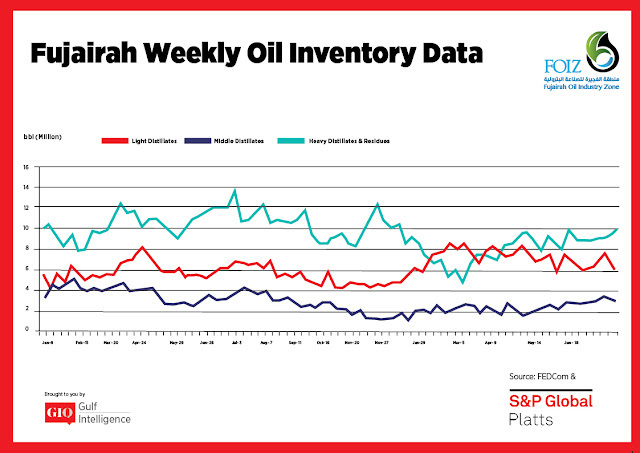 The forward market structure is in a slight contango amidst a general oversupply in the East of Suez due to seasonally lower demand in parts of Asia. The front-month East-West Exchange of Futures for Swap was priced at minus $8.44/mt yesterday, but recent high clean freight rates to the West of Suez mean arbitrage flows may provide only limited relief. 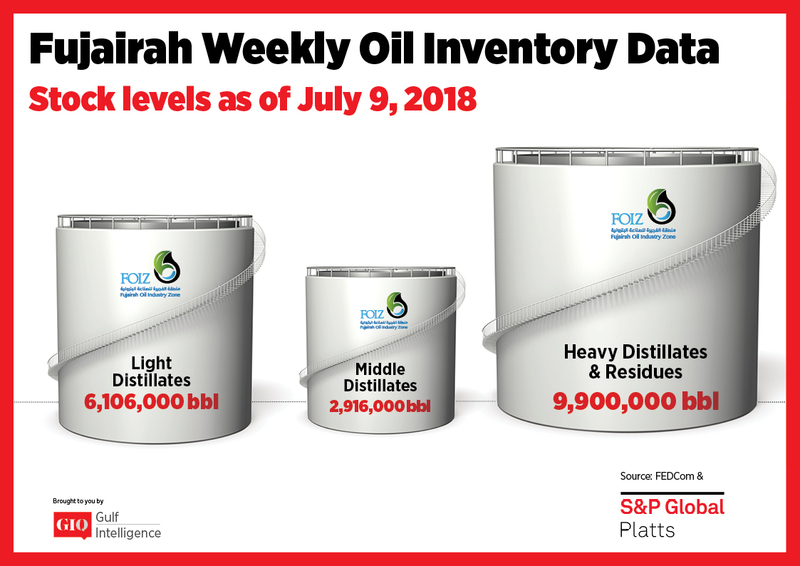 Stocks of heavy distillates and residues rose by 8.4% week on week to 9.9 million barrels – the highest level since the beginning of the year. The last time stocks topped 10 million barrels was December 25, 2017. Bunker fuel prices continue to rise in line with crude prices, which left buying the interest in Fujairah flat yesterday. Power sector demand remains at high levels due to summer temperatures; Pakistan State Oil was seeking 195,000 mt of HSFO and 55,000 mt of LSFO for August delivery. Front-month time spreads for Arab Gulf 180 CST swaps saw a weaker backwardation of $4.50/mt yesterday, suggesting the recent tightness in the Singapore market could be set to ease.